A brief technical overview of the epigenetic mechanisms of DNA methylation enzymes and DNA demethylation enzymes. DNA methyltransferases add a methyl group to position 5 of the cytosine in DNA, using S-adenosylmethionine (SAM) as a methyl donor. This group comprises DNMT1, DNMT3A and DNMT3B. DNMT1 mediates maintenance methylation after DNA replication, and acts on the hemimethylated strand. DNMT3A and DNMT3B are involved in de novo or new methylation, and they are targeted to specific regions in the genome. DNMT3A mediates maternal and paternal imprinting, while DNMT3B is involved in methylation in pericentromeric repetitive regions. Another protein, DNMT3L, associates with DNMT3A and 3B and aids in methylation, although it lacks catalytic activity. Colorimetrically measure DNA methyltransferase activity or inhibition at extremely fast speeds on a 96-stripwell microplate using EpiGentek's EpiQuik DNMT Activity/Inhibition Assay Ultra Kit (Colorimetric). DNA demethylases catalyze the reversal of DNA methylation. Controversy exists on whether the methyl group can be directly removed from the cytosine, by breaking the carbon-carbon bond, as it is a highly unfavorable thermodynamic reaction. 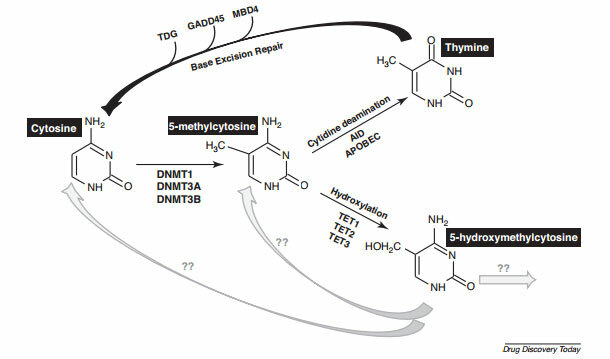 Rather DNA demethylation occurs by 2 major mechanisms: conversion of the methylcytosine by deamination, catalyzed by the cytidine deaminases, followed by base excision by DNA glycosylases and insertion of an unmodified cytosine; or conversion of the methylcytosine by hydroxylation, catalyzed by the TET enzymes. The cytidine deaminases, activated induced cytidine deaminase (AID) and Apolipoprotein B mRNA editing enzyme 1 (APOBEC1), catalyze the conversion of methylcytosine into thymine and this leads to T:G mismatches, which are then repaired by DNA glycosylases such as thymine-DNA glycosylase (TDG), which excise the thymine followed by replacement with an unmodified cytosine. In plants, methylcytosine is excised without previous conversion by a family of DNA glycosylases and subsequently replaced by an unmodified cytosine. The Ten-Eleven Translocation (TET) enzymes comprise a family of three dioxygenases TET 1-3, that depend on iron (II) and 2-oxoglutarate, as cofactors for activity. They convert the methylcytosine into other cytosine derivatives by hydroxylation. The TET enzymes catalyze the sequential oxidations of 5-mC to 5-hydroxymethylcytosine (5-hmC) and to 5-formylcytosine (5-fC and 5-carboxycytosine (5-caC), and also the direct conversion to 5-fC and 5-caC from 5-mC. 5-fC and 5-caC could be converted back to cytosine by thymine DNA glycosylase (TDG) in base excision repair, rendering the cytosine completely unmethylated. Cytosine methylation/demethylation and the enzymes responsible. Credit: Carey N, et al. 2011. DNA demethylases: a new epigenetic frontier in drug discovery Figure 2.